Last January, we shared a list of 2014 conferences that our Viget staff planned to attend. Throughout the past twelve months, we’ve made our respective pilgrimages to conference centers across the country, donned our attendee or speaker badges, posted choice moments on social, posed for professional headshots, and returned home with new skills and insights. In all, thirty-five staff members attended a total of twenty-three conference events. We also sent speakers to five large conferences, and we look forward to continuing that trend in 2015. One way our staff share knowledge acquired at conferences is by writing brief, internally-posted recaps of each conference they attend. Recaps vary in content, but they tend to include notes on favorite sessions, main takeaways, and memorable quotes. As we’ve written and read these recaps over the past year, we’ve observed a few themes emerging. Here are just a few of the ideas we’ve seen dominate the conference circuit in 2014. At Forge Conference, Project Manager Amanda Ruehlen heard this Darwin quotation cited more than once: “It is not the strongest of the species that survives, nor the most intelligent, but rather the one most adaptable to change.” The ways in which agencies anticipate evolving are countless. At Story, attended by Copywriter Ally Fouts, Melissa Weigel of Moment Factory cited Moment’s mantra of “the screen doesn’t matter” and described operating from the principle that public space is no longer physical. Designers attending The Illustration Conference, including Viget Designer Minh Tran, reflected on the powerful role that illustration and animation may have on future interactive work. During his annual participation in Owner Camp, CEO Brian Williams shared Viget’s long-held priority of pushing for clients and projects that allow our teams to experiment with emerging technologies. By the same token, Senior Front-End Developer Dan Tello made a case for a “desktop last” approach to design and development as a speaker at GiantConf. Senior Front-End Developer Trevor Davis, an early advocate for Craft CMS, spoke at the Craft Summit this year. And Developers Zachary Porter and Eli Fatsi, who had already begun learning Elixir, a newly-developed functional programming language, attended ElixirConf, the first conference devoted to Elixir; Eli subsequently used Elixir to build JamBells, one of our latest Pointless Corp creations. 2. Follow your dreams. Or something like that. 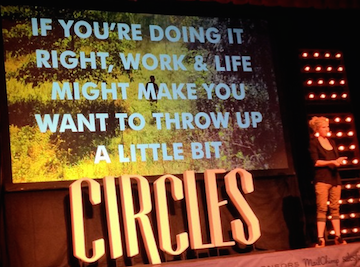 Variations include: “do what you love” or “love what you do” or “find your calling.” This theme emerged from conferences with an aspirational bent, like Circles, as well as from relatively pragmatic conferences, like Digital PM Summit. Industry-wide, there seems to be a preoccupation or even obsession with reconciling the pressures and responsibilities of daily work with one’s deeper sense of meaning or vocation. While at Hopscotch Design Fest, I witnessed Elle Luna articulate the choice as one between “must” (what you really want to do with your life) and “should” (what everyone else makes you feel obligated to do with your life). (You can read more here.) One takeaway common to multiple talks: quit your job. We’re pleased to report that none of our staff followed up on this action item upon return to the office. 3. Strong communication is key. In an industry built on relationships between agencies and clients, it’s no surprise that this perennial theme held strong in 2014. At Forge, Tami Evnin of Nasdaq emphasized the value of in-person communication, and described flying her team across the country for team sketching sessions. Also at Forge, Debra Gelman of EPAM Empathy Lab recommended clarifying definitions with clients up front in order to make feedback more valuable. At Digital PM Summit, Viget Senior Project Manager Josh Korr stressed the importance of defining a taxonomy to improve communication during the QA process. And multiple speakers urged PM’s (and all of us) to move away from the intuitive sense that our own way of communicating is the right or “normal” way to communicate. Instead, they stressed practicing empathy in all our interactions. This theme, on the other hand, does come as something of a surprise. In an industry as future-oriented as ours (see item 1 above, “Change and adapt.”), looking back often seems to hinder progress. And yet, history seems to be attracting new attention as a source of lessons and inspiration. At Circles, Jason Kernevich and Dustin Summers of The Heads of State talked about the importance of understanding a client’s history and traditions, as well as the importance for designers of developing an understanding of their own personal history. And, at Forge, Josh Payton of Huge stressed the importance of understanding the history of your field, as well as of work in general, citing the development of generalists through the Renaissance and Industrial Revolution from the highly specialized guild system of the Middle Ages. Our list is by no means exhaustive, though we hope it's thought-provoking. Have you noticed any other major themes emerge at conferences in 2014? If so, we’d love to hear about it in the comments below.